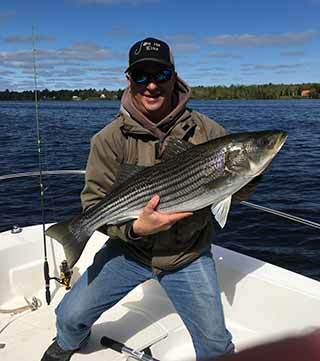 The Miramichi Striper Cup is a striped bass tournament on the Miramichi River in the city of Miramichi, New Brunswick. The tournament consists of four divisions. It includes a team division, individual division, shore division and a family division. This tournament began two years ago and has become the biggest tourney on the east coast of Canada. Not long ago, the striped bass were all but decimated. Due to government intervention, the striped bass have made a comeback and have completely taken over the river. Though they are plentiful, this fishery is only hot for roughly a month (mid-May to mid-June) on the Miramichi while spawning occurs. Three of my good friends and I decided to enter the tournament this year, naming our team “On the Line.” It was an experience I will never forget and plan to do again next year. I had never seen so many fish in an area at one time! You can almost see the water boil with them spawning. At one point, we had a closer view of what was causing the boiling. We saw a big female float by our boat at the surface with 8 to 12 smaller males all around her, seemingly nudging her all over her body with their snouts. We then realized why we would never get a strike when casting out to these boils. They were likely attempting to get her to drop her eggs so they could fertilize them. Either way, they were not at all interested in our offerings. We witnessed this same occurrence a few more times over the weekend which more-or-less confirmed our suspicions. On day one we caught about 20 to 30 fish, landing us in 88th place with only 13.6 pounds of fish. Despite the lack of lunkers, we had an absolute blast reeling in fish one after another. It was a cold, cloudy and windy day, but we were still confident we would get fish and we did. I always prefer fishing on a cloudy day over a sunny one. The second day gave us completely different weather, with little to no wind in the morning, bright sunny skies, and somewhat warmer temperatures. Due to one of our many mishaps that weekend, which involved not being able to find the boat key, we ended up having an hour delay to start off day two. I didn’t like hitting the water that late, as I find fish tend to switch off once the sun hits the water. Generally, fishing did turn out to be very slow for most competitors as a result of the warm, sunny day. We only got two fish on the second day, but we still made a bit of a comeback with my 15.5-pound hen, moving us up to 35th place. Not great, but not bad for a first attempt at a striped bass tournament, competing against some of the best bass anglers in Canada and the USA. Overall, we enjoyed participating in this tournament and we had a great time. The organizers did a fantastic job pulling off such a large competition with probably 2,000 participants. It has been growing exponentially since its beginning two years ago, and will likely be even bigger next year with even more fantastic prizes. We will definitely be back next year! To learn more about this tourney, visit //miramichistripercup.ca/.